The graph below presents the employment patterns in the USA between 1930 and 2010. In 1930, 75% of the labour force in the USA was employed in farming, fishing and foresting while only 10% worked in sales and office and trade. At the same time both the Industrial sector and the technical sector constituted just 2% of the workforce each. This situation changed only very gradually over the next 20 years, except for the technical workforce, which increased more than threefold. However by 1980 there had been a significant change in the pattern of employment. While the farming, fishing and foresting employees had declined in number to 40% of the workforce, Industrial employees as well as technical had increased their share to 13% and 10% respectively. Similarly the sales and office sectors did not increase until 1980. 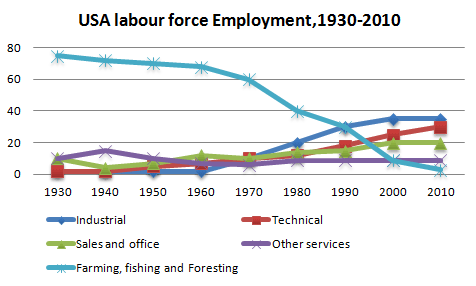 The most dramatic change could be seen by 2000, when the proportion of farming, fishing and foresting works reduced to just 10% while the three other major sectors had all increased to over 20% of the workforce. Test tip1: spend time studying the information first. The title given may help you with your first sentence, but try to use different words and don’t just copy words from the question paper. Try to identify key areas in the data. Do not miss out any important details in your description and make sure you stick to the time limit so that you leave enough time to answer task 2.
also too like x, y…. as…. as…. just as x, y… just as x, so y….